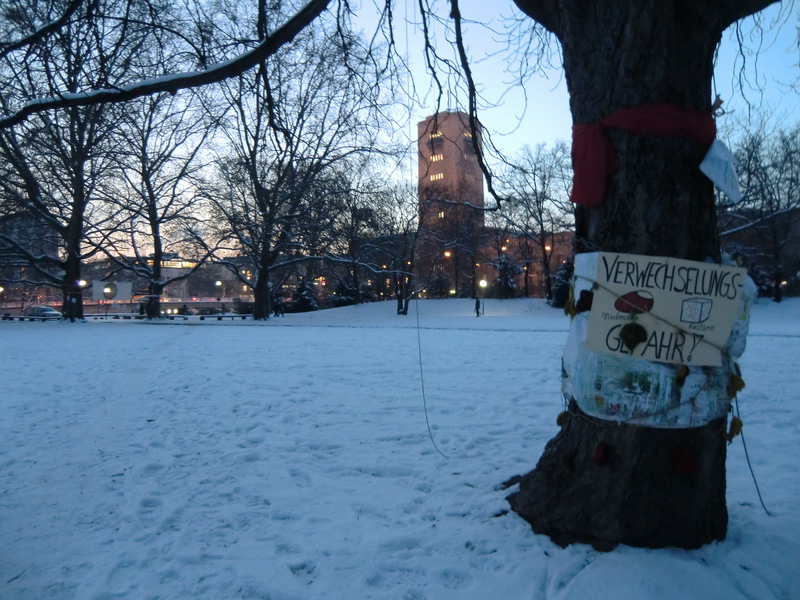 This is the final post in a three-part series about the controversial Stuttgart 21 project. Links to Part One and Two are on the right. The controversy over Stuttgart 21 has gotten under my skin. This isn’t my city, I don’t have to live with the consequences of whatever happens here, but I can’t help obsessing about it. I think it troubles me so much because it mirrors the kinds of painful, divisive battles we have over transport and land use projects in California, magnified and amplified ten-fold. Despite all the time I’ve spent reading and listening to people on both sides of the Stuttgart 21 controversy, I still don’t feel like I can pass judgement about who’s right and who’s wrong. So if you were expecting me to make a final pronouncement, let me kill the suspense now, cuz it ain’t happening. But the intensity of this debate – which blows away anything I have ever seen in California urban planning policy – has refocused my attention on the complex interactions between local actions and global consequences. Conflicts between local and global are not unique to urban planning. Solar installations in the desert have recently gotten a lot of media attention because of the interesting paradox that what’s good for the planet (clean, renewable energy) can be bad for the local ecosystem (destruction of wildlife habitat and watersheds). In the case of energy policy there is a third path: distributed generation. Instead of building solar panels in the desert, put them on the roofs of houses and office buildings. In the case of urban planning, there is rarely a third path. You can negotiate about the details of the project, but in the end you either built it – or you don’t. In the end, we will have to decide whether to build High Speed Rail in California, despite its mammoth cost and despite its unavoidable local impacts to farmland, wildlife and neighborhoods. We will have to decide whether to complete the subway to the west side of Los Angeles. And whether to sink more money into stalled redevelopment projects like the Sacramento railyard. And, of course, we will have to approve Sustainable Communities Strategies (the new regional plans required under SB 375) that will involve big investments and create some winners and losers. None of these projects will be cheap, and all will have negative impacts, and all will have some amount of controversy, even among our allies. So how we decide when to say yes, and when to pull the plug? In his book Collapse: How Societies Choose to Fail or Succeed, evolutionary behaviorist Jared Diamond uses the example of Easter Island to illustrate how short-term thinking can lead to long-term ecological disaster. What were they thinking, he asks, when they cut down the last tree on Easter Island, thereby making the island uninhabitable? He argues that human beings are wired to understand immediate challenges and we are very adept at dealing with them. But we are not as good at recognizing – and responding to – long-term trends and changes. This is the reason we take on too much credit card debt, get into mortgages we can’t afford, sell people mortgages they can’t afford. . . it all comes down to our innate propensity to prioritize immediate needs over long-term considerations. Similar thinking affects our urban planning decisions, in multiple ways. On the one hand, there is the inevitable response of people immediately affected by the project – the construction, the noise, the changes to my neighborhood. On the other hand, projects can also take on an inertia of their own – as the planning process drags on and on, project proponents and decision-makers just want to get it over with. They become impatient and resist asking – or answering – the difficult questions. This, too, is a failure to think long term. Both of these forces are at work here in Stuttgart. You have the protestors thinking mostly about the immediate impacts – the trees, the money, the ten years of construction chaos – rather than the long-term, global benefits of better rail connections, less auto travel and focusing development in the city center instead of out in the rural areas. This project will fix one of the more problematic stretches of rail infrastructure in central Europe, and is part of a Europe-wide plan to create faster, easier connections among major cities. France has largely done this with their TGV system, which has made it faster and cheaper to take a train just about anywhere in France, dramatically reducing intercity car travel. Having such a system all across Europe would be a game-changer for CO2 emissions, but it won’t come cheap. 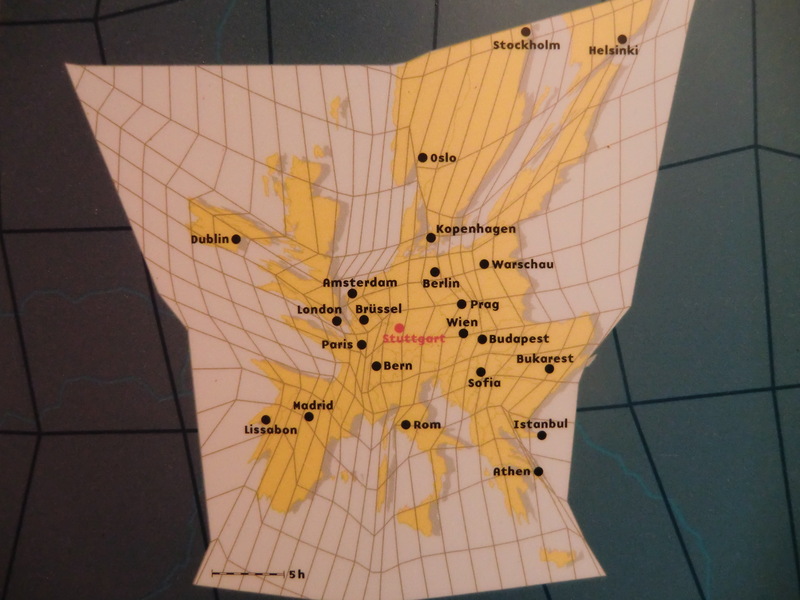 A map of Europe scaled to travel times via the envisioned high speed rail network. But the agencies are also guilty of short-term thinking. They are digging in their heels, refusing to reconsider some of the decisions they made ten years ago because they simply want to get on with it. The protestors make a very compelling case that key elements of the plan should be revised – or at least studied – to make it cheaper and less impactful while still accomplishing the major goals of the project. The agencies’ stubborn refusal to reopen the debate merely adds fuel to the growing backlash, undermines public support, and could very well cost the ruling party (the CDP, the center-right party of German Chancellor Angela Merkel) its majority in elections next year, throwing the Stuttgart 21 project into political jeopardy. The CDP has ruled unopposed in this conservative region for 50 years, but recent polls suggest that the Greens and the center-left SDP have benefitted tremendously from this controversy and will likely win the city and regional elections in March. Its unclear what that would mean for Stuttgart 21. The Greens say they will kill the project if they win the election. The agencies say they already have a binding contract and the project must go forward, regardless of who wins. However it shakes out, its sure to be a long and bitter struggle, and one that will cast a long dark shadow over future transport and planning decisions in Stuttgart and across Germany. Have meaningful cost-benefit analyses. Is 5 billion euros a lot to spend to get a 30% increase in train capacity? I don’t know. Is a 15% reduction in VMT by 2035 a reasonable goal? I think so. What will be the true costs of high speed rail and how do those compare to the benefits? I really don’t know. We’ve got to get better at standardizing these analyses and putting them in meaningful context, so that we can tell when something is a good investment, economically, environmentally and socially. Recognize that we are biased. We humans do a lousy job of thinking long term and big picture. We need to be aware of this and must constantly remind ourselves – and everyone else – about what happens when we act locally without thinking globally. When a project is delayed, realize that the world has changed. This is perhaps the biggest mistake they made in Stuttgart. Everything was OK ten years ago, so it will be OK now right? Wrong. When in doubt we should err on the side of more discussion, not less. 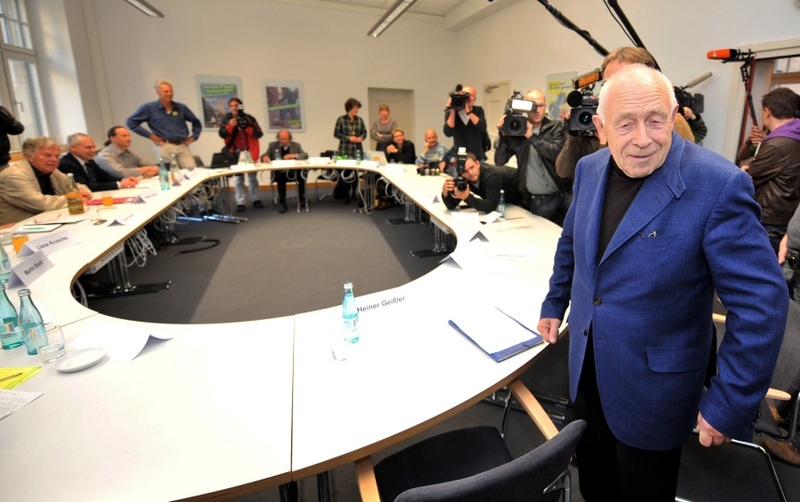 Heiner Geißler aka Yoda during the televised Stuttgart 21 mediation. to mediate negotiations between the two opposing sides, which he did in a public forum that was broadcast on television. A lot of people tuned in for the six-week series of meetings. While it didn’t bring about a happy compromise, it did educate a lot of people about the project, and changed their minds about it. According to the newspaper Stuttgarter Nachricten, before the televised mediation a majority of people were opposed to the project. After the forum, public opinion had shifted and a majority now support it – albeit with lots of caveats. It seems like a good idea. Too bad it didn’t happen earlier in the process. Ensure complete transparency and democratic participation. I know I’m preaching to the choir here, but this is a good reminder of what happens when people don’t feel like they have been heard. Sometimes it feels like pulling teeth to get people to show up to meetings and hearings in the early stages of a planning process, but we just have to do it. Agencies should partner with respected community organizations from all across the political spectrum to engage their constituencies and get them to the table. And it should go without saying that when agencies and project proponents try to hide the ball, it can backfire bigtime. Recognize its a pluralistic world – left right blue green human rabbit. . . We have a tendency to frame everything in dualities. But the reality is far more complex. 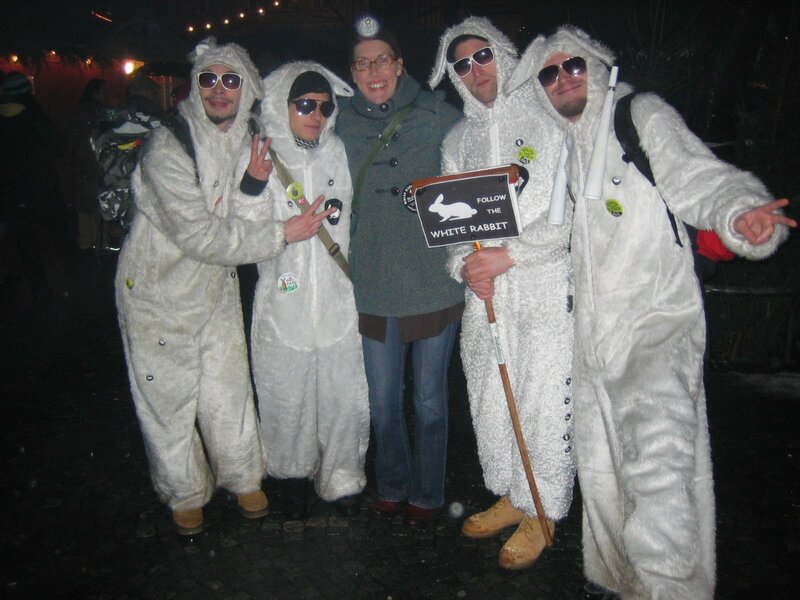 Take the white rabbits for example – remember them, the bouncing protestors with the bunny suits? Turns out they were not what I expected (not that I really knew what to expect). They are dedicated advocates and well-educated about the project, but they also see the protest as an opportunity to create some interesting performance-protest art. They have some great photos and films which you can find on their Facebook page. As for me, I won’t be running off to join the rabbits. 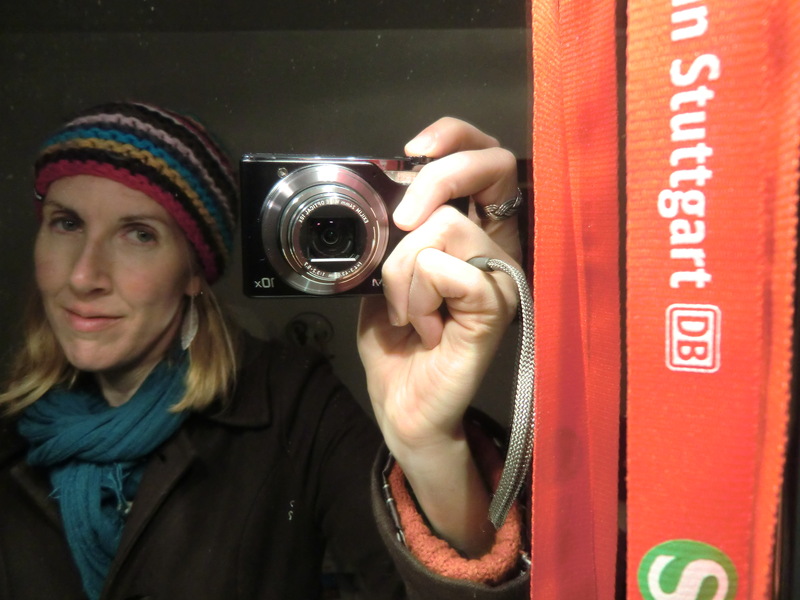 Tomorrow is my last day in Stuttgart. I have learned a lot and, in the end, had a pretty good experience here. But I also feel exhausted by it. The other night I dreamt I was standing in a meadow that looked like a combination of Stuttgart’s central park and a meadow near my old house in Tahoe. In my dream there was snow and wildflowers and tall green grass – all at the same time – and a big flock of chickadees that landed in a small, perfectly round tree. I remember thinking, wow, this place is pretty special. Too bad it can’t stay this way. This entry was posted in Stuttgart. Bookmark the permalink. Wonderful case and some great thoughts at the end. How relevant to many of our projects even with different legal parameters and political structures. Agree completely – especially on the part about cost-benefit analyses! And as we’re conducting these cost-benefit analyses – there’s also something to be said (and perhaps calculated) about the value of these spaces to the public. If we want to ensure a sense of public ownership in our transportation decisions, it’s important to assess the cost of cultural (and societal) value of places such as historical train stations and parks to citizens in comparison to increased capacity and VMT reductions. People need to understand in everyday language what they’re gaining and losing here.